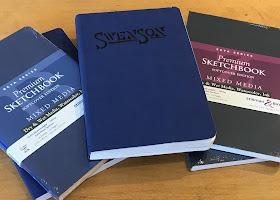 I'm often asked about my sketchbooks. Do people ask because I'm a teacher, someone they trust or because they like my artwork? Why do I prefer one brand or kind over another? I've tried a lot of different books in the last 25 years. It all comes down to paper, size, quality, cover and binding. Time is the greatest teacher in learning what fits my needs. What feels comfortable to each of us differs greatly. I've come to my sketchbook choices over time through experience (trial and error). Today I generally use two different kinds of sketchbooks. 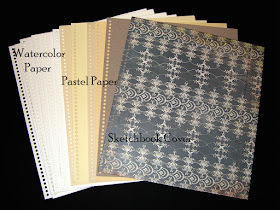 Sketchbook #2: Manufactured sketchbooks. Stillman & Birn are my favorite store bought brand. I like these books for many reasons: paper, size, quality, cover, binding and the people who stand behind the company. Stillman & Birn has a sketchbook to fit everyone's need: six types of papers, numerous sizes, stitch bound and spiral bound, hardbound and soft-back covers. What more could a person want? 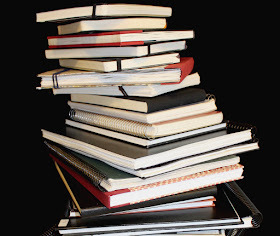 I have countless sketchbooks filled with travels, coffee shops, plein air sketches and personal life experience are held within the covers of these books. I refer to these books as my illustrated journals. My favorite size: 8.5 x 5.5 inch. Paper surface: I'd narrow it down to the Beta, Delta and Zeta. All are heavy weight and handle lots of paint and water. Here's a sketchbook tour inside my Stillman & Birn Sketchbooks. Thanks for sharing Brenda, I also am in love with the new softbound beta. Love your journals! Karla, The softbound books are wonderful! Glad you're enjoying them. Hi Brenda, sorry for using the comments, we looked for a contact tab.. but couldn't find any. How can we send you an email? We are a new manufacturer for palettes and brushes, one of our customers has said she read a recommendation for our palette at your blog, so we wanted to say thank you! !